Major Hamza Al-Mustapha, former Chief Security Officer (CSO) to late Head of State, Gen. Sani Abacha, has revealed that he escaped several plots to kill him while he was still in prison. Al-Mustapha said he would have been eliminated if not for the timely intervention of Wantaregh Paul Unongo and retired Controller of Prison, Iorbee Ihiagh. 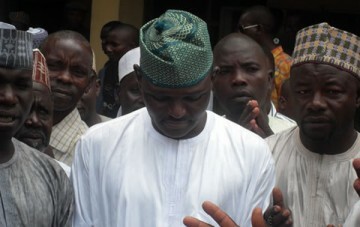 Al-Mustapha who was one of the most powerful men in the country during the administration of the late Head of State said this over the weekend in Jato Akaa when he led his wife, son of the former Head of State, Mohammed Abacha, friends and loyalists to pay homage to Second Republic Minister of Steel, Wataregh Paul Unongo, in his country home. He said: “On the 29th of March, 2004, some people planned to kill me. I was to be forced out of the prison and taken to an unknown destination where they were to take my life. “Thank God, a reliable and trusted son of Tivland and my friend was officer in charge. He was directed to release me without documents in the wee hours of the night. “As God would have it, he sought for guidance from our father and leader, Wantaregh Paul Unongo, who in turn directed him not to allow them take me away for subsequent killing. “God saved my life on that day. Let me say, from the day the journey started, the day my father, the late General Sani Abacha, died to the 12th of of July this year when I was released, we have had so many attempts to take our lives but God Almighty preserved us. “Alhaji Mohammed Sani Abacha and I initially were framed through scripted stories released to the media and we were arrested. Thank God that subsequently justice was served having passed through series of travails and torture.